Just because Christmas has passed doesn't mean we stop baking cookies. It doesn't mean we have to stop eating 7-course meals everyday or slip whiskey into our morning coffee either. And unless your new year resolution is to put more chocolate in your life or bake cinnamon rolls every single Sunday, then I don't want to hear it. And if your resolution is too kick sugar, then I'm afraid this relationship isn't going to work. My oven door is always open to a soft batch of cookie dough. I'm thinking of putting a welcome mat on the kitchen floor just to make it feel that much more inviting. Is that weird? I was all about vanilla bean this season. Simple buttery cookies infused with thousands of teeny tiny black vanilla seeds are addictive and fully satisfying. I was all over these Vanilla Bean Sugar Cookie Shapes too. 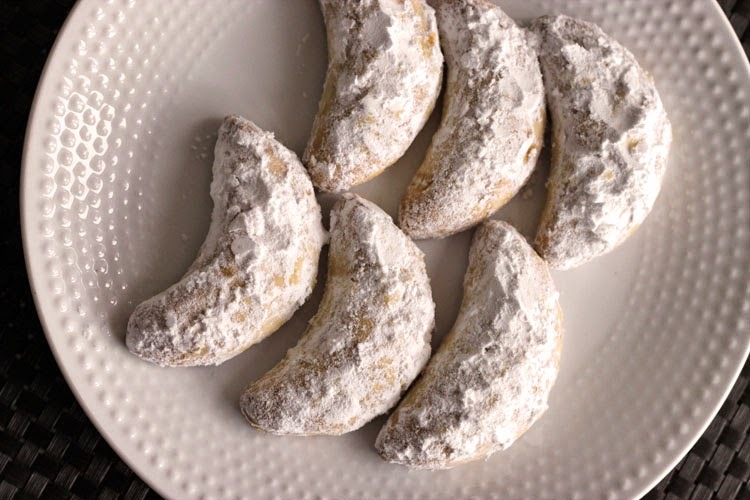 The recipe for today is a traditional Austrian cookie recipe. 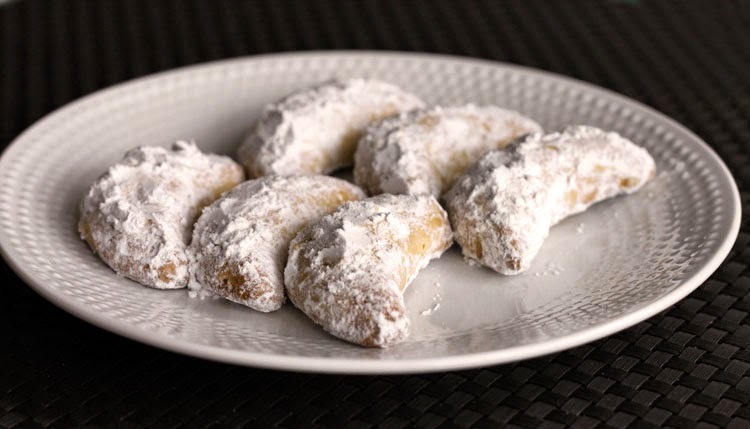 They're similar to Mexican Wedding Cookies or Russian Tea Cakes, but with the addition of egg yolk to give them a bit more structure and crunch. It's based on a buttery, not-too-sweet, shortbread-like dough loaded with ground walnuts. We bake until golden all around, without letting the tips get too dark. 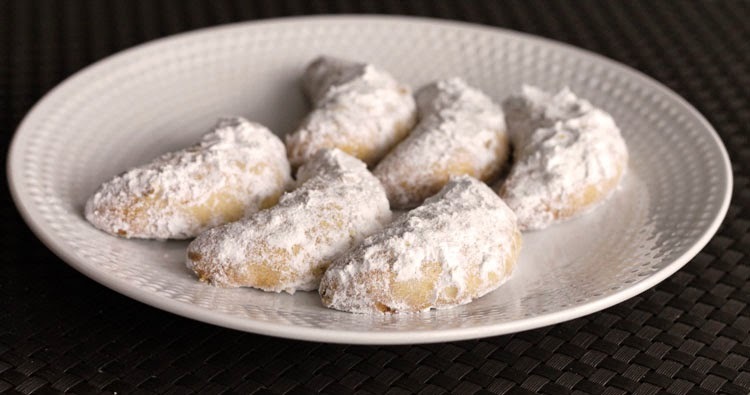 They're very delicate when warm, so let them cool for a few minutes on the tray before tossing them in powdered sugar. 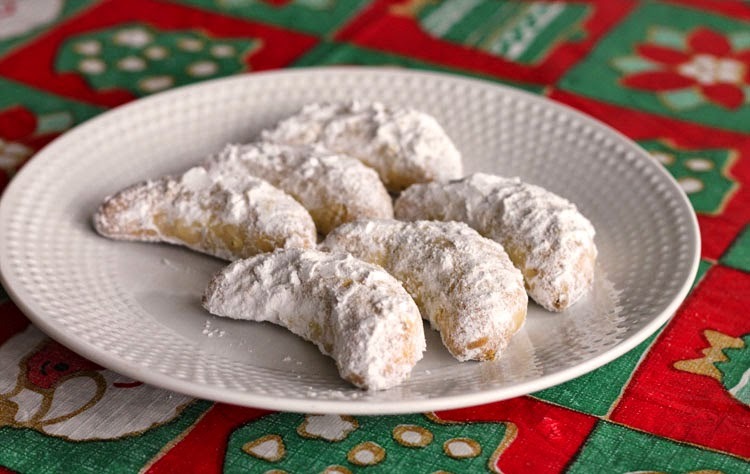 Actually we're dunking and dousing them in powdered sugar. It's nice when they're still a bit warm because the icing sugar just melts a bit right into the cookie. I like to go for a double dose of the sweet stuff - warm dunk and a cold dunk. 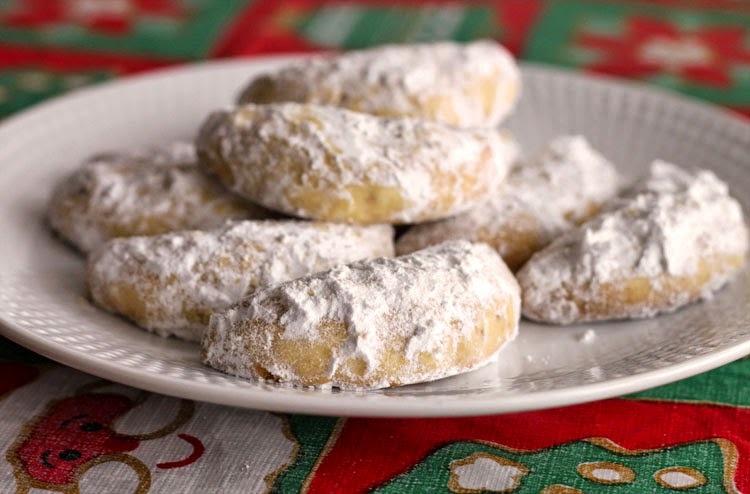 The only mistake you can make eating these cookies is inhaling to hard and sucking icing sugar right up your nose. In a large bowl, beat together butter and sugar with a wooden spoon until pale and fluffy. Beat in egg yolk, salt and vanilla bean paste or extract until well combined. Add the flour and ground walnuts and stir until blended and it forms a nice smooth dough. Use your hands to bring the dough together. Wrap in plastic wrap and refrigerate for 1 hour. Preheat the oven to 375˚F (190°C). Line two baking sheets with baking parchment paper. Divide the dough into three pieces and roll each piece into a log with about 2 cm diameter. Slice the dough into 10 or 12 pieces. Roll each piece between your palms to form a little log and then shape each log into little crescents on the baking tray. Space them about 2 inches apart as they will spread a bit. Bake until lightly golden around the edges, but don't let the tips get too dark, about 10-12 minutes. Transfer trays to a wire rack to cool for a couple of minutes. 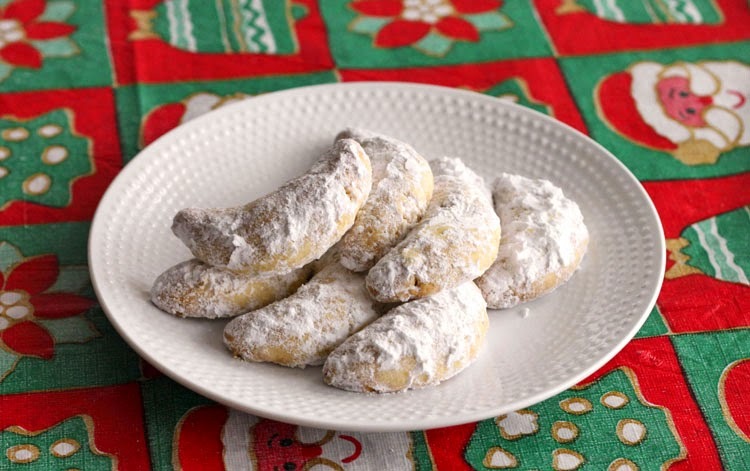 When the cookies have set and can be handled gently without crumbling, roll them around in icing sugar and then place on the tray to finish cooling. I like to dunk them again in icing sugar once they've cooled completely. Store in an airtight container. Yum - they look delicious! 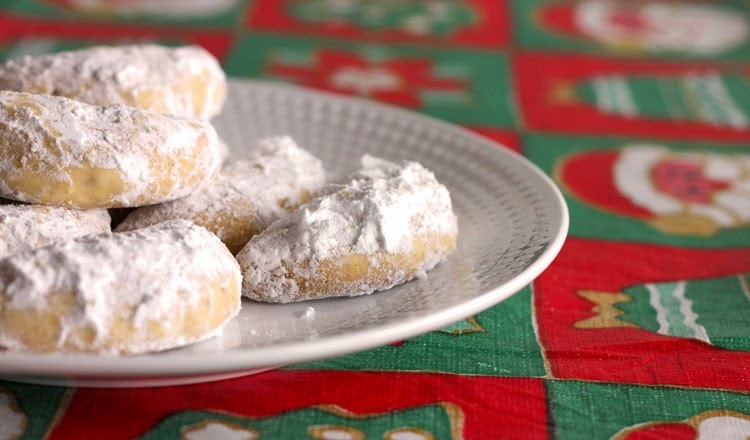 And I definitely agree - cookies can be made anytime of the year, even after Christmas. Thanks for sharing the recipe.